The 2013 international arts calendar is set to kick off with the third edition of Art Stage Singapore, taking place from 24 – 27 January at Marina Bay Sands. Art Stage Singapore is the only international art fair with a special focus on Southeast Asia and Asia Pacific, with a view to fostering Southeast Asian artists and galleries. 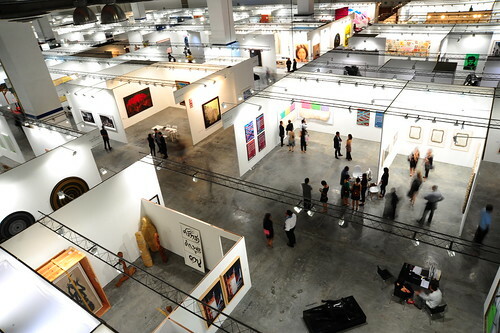 Featuring approximately 130 galleries comprising a mix of international and Asian names, Art Stage Singapore has become the definitive rendezvous for discerning collectors, artists, art connoisseurs and art world professionals. For Fair Director and founder of Art Stage Singapore, Lorenzo Rudolf, Art Stage Singapore will be, “A fair for everybody, not just for collectors but more like an open museum.” Indeed, Lorenzo Rudolf pulls no punches having held the post of Director at the world-renowned Art Basel. He also wants Art Stage Singapore to be a part of the local arts scene and for the past few years, it has partnered with the National Arts Council to showcase the Singapore Platform, an initiative to introduce Singapore artists and curators to a global audience. Key to the success of Art Stage Singapore is its process of constant enquiry, self-reflection and industry-leading evolution. For the 2013 edition, the expanded focus on Asia Pacific ushers the introduction of the Indonesian Pavilion, the Australian Platform and Art Stage +. Lorenzo Rudolf speaks enthusiastically about the Indonesian Pavilion. This new initiative aims to be the most reflective, orchestrated representation of Indonesia’s art scene. With its own entrance within the main Art Stage fair and over 1000 square metres of dedicated show space, this first-of-its-kind artistic platform will display key Indonesian galleries as well as over 30 of Indonesia’s established and emerging contemporary artists. “The Best of Indonesia” is a curated exhibition showcasing the true landscape of Indonesian art and providing these artists with an international platform. In 2013, Art Stage Singapore will push into a new digital frontier with the launch of Art Stage +. In a ground-breaking collaboration with Gallerist Inc, Art Stage + will provide a global audience with the opportunity to interact with a fully functional virtual replica of the fair. Opening three days prior to the fair, visitors will be allowed a preview of works from every participating gallery. Online sales will commence in tandem with the public opening of the physical fair and will continue until 28 January, one day after the fair closes its doors. PRICELESS: Fashioning currency, worth and values in the faces of notes.